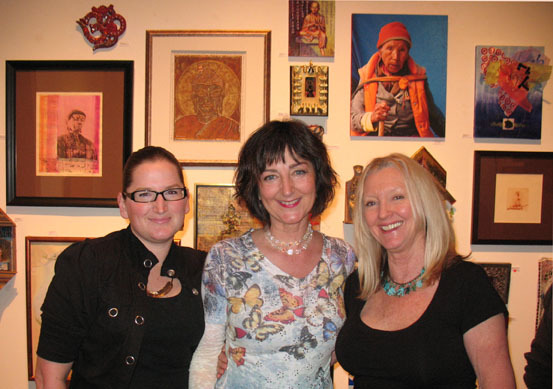 Here I am at the Buddha Abide Show opening at the Frameworks Gallery in Santa Barbara with my daughter Mika and Lark Batteau Bailey who puts on the show every year. This year I submitted two pieces and they were both accepted. This is my 4th year of participation as I so believe in the work that Lark does. She donates a portion of the sales to Tenzin Lodoe in the Tibetan Children’s Village and the women who are assisted by The Domestic Violence Solutions in Santa Barbara. Art for a cause! We all love to create art and what a better way to create and be able to donate to a good cause. I’m all for it and I know a lot of other artists are as well. Witness the great turnout. The show has now been held over due to the ferocious Jesusita fire in Santa Barbara . They will have the First Thursday (that was postponed) this Thursday to again celebrate ART. Lark did a really clever and fun addition to this year’s event. 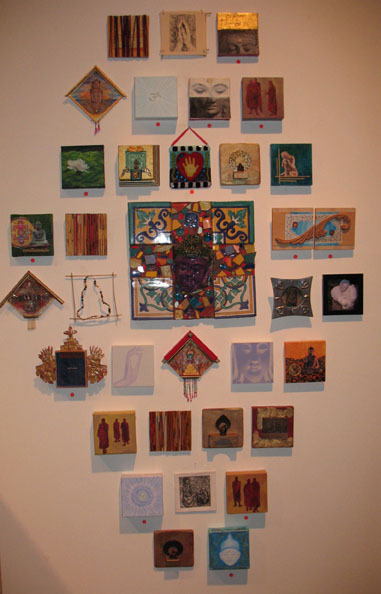 She had artists submit 5×5 pieces that are sold for only $50, what a great idea. I did 2 pieces for this and loved the size, so now I’m inspired to do a little series in this size. We’ll see what happens! . All the 5×5 pieces were brilliantly displayed by Christi the owner of Frameworks Gallery. 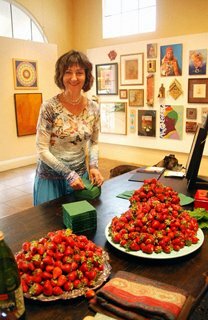 Here is Lark with her fantasmagorical organic succulent strawberries that she served. I was lucky to go home with a basket full, which of course never made it that far as I ate them in the car on the way home they were so yummy! Kind of reminded me of the wild strawberries we had in Sweden that I ate growing up there.